Resources — Louis Wohl & Sons, Inc. The Innovative Foodservice Companies want to do it's part in educating our customers and providing them with information to help them make their establishment a success. Below you will find many helpful articles to help you differentiate and determine what it is exactly that you want/need. If you have any further questions, do not hesitate to contact us. Are you selecting the right Fryer? Are you selecting the right range? 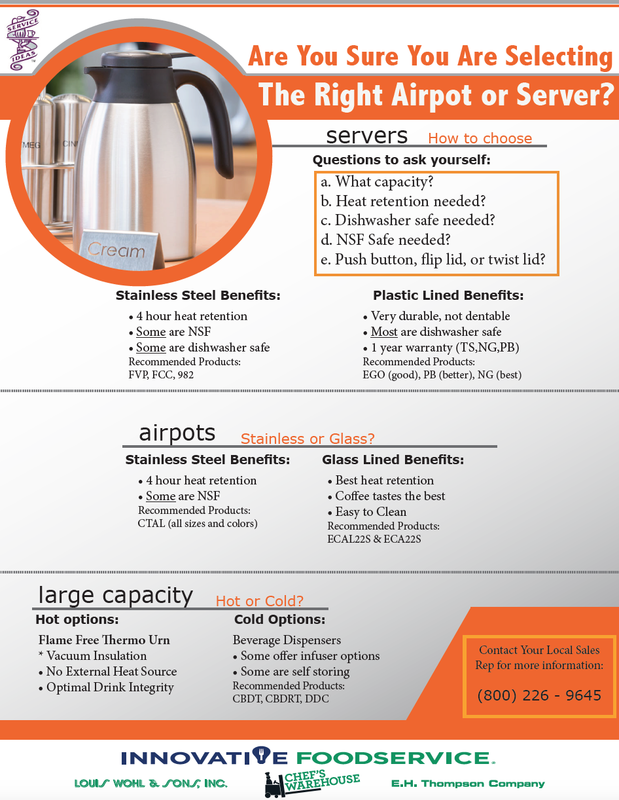 Are you selecting the right Airpot or Server? Are you selecting the right slicer? 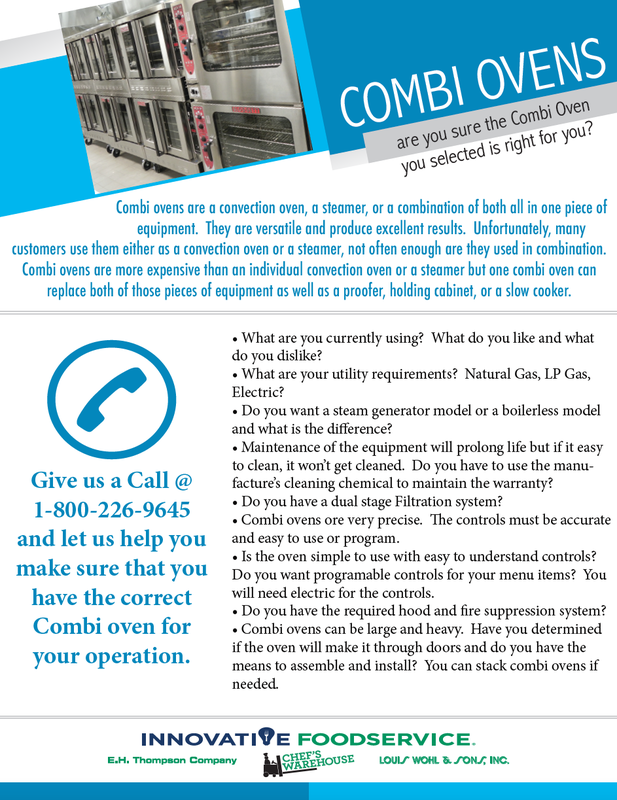 Are you selecting the right Combi Oven? Are you selecting the right Griddle? 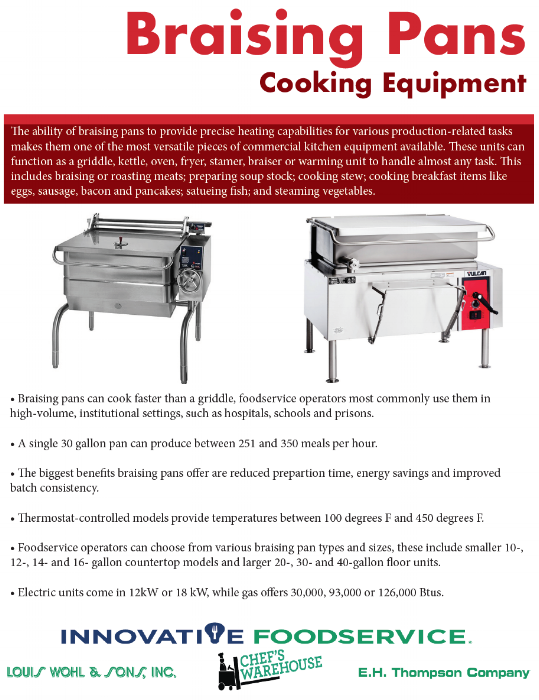 Are you selecting the right steam equipment? We are dedicated to answering questions you may have. Below are some common questions we come upon, if you do not see your question below, contact us and someone will reach out to you shortly. Click HERE for more information about receiving product. No goods will be accepted for returns unless we are notified within fifteen (15) days after receipt, and then only upon our authorization in writing. All returned products must be in new, unused condition and must be in its original packaging. All returns will be inspected for damage prior to issuance of a credit or refund. Items that have been used cannot be credited unless items are defective. All shipments must be shipped freight prepaid to us. There will be handling and restocking charges of 25% made on all returns and/or exchanges, except in cases of shipping errors or defective product. Special orders cannot be returned. +I ordered the wrong item, how do I return it? Contact Customer Service to receive an authorization number from us. Merchandise should be returned to the address on the return merchandise authorization. All returns must be shipped freight, and are subject to inspection upon receipt. Once we receive the item back, we will process your new order, apply any necessary credits or charges, and ship the exchanged item to you. Remember, that any custom or special order items cannot be returned. +My equipment is malfunctioning, can I return it? We do not accept returns or exchanges for any items that have been used. However, we will work very closely with you and a service agency to coordinate a service call in order to diagnose and repair your malfunctioning item as quickly as possible, under the terms of manufacturer's warranty. Although, the Innovative Foodservice Companies do not lease equipment, we do have relationships with several qualified leasing companies that we work with to assist you in a lease-to-purchase agreement. +Why can't I put a commercial range in my home? Gas ranges and other pieces of cooking equipment cannot be sold for residential use because of the inherent hazard to the home. The gas equipment that we sell is certified by the American Gas Association (AGA) for commercial use only, not for residential use. Therefore, should your home ever experience a fire, in most probability, your homeowner's insurance will not cover that incident. Your entire policy may be voided, regardless of whether the range was the reason for the fire or not. In addition, the manufacturer's warranty is voided once this unit is installed in a private residence. These units do not have insulated cabinets and feature 24 house pilots, which also presents a hazard. +My equipment is malfunctioning, how do I use the product warranty? You can contact the manufacturer directly to request warranty service, or you can contact Customer Service for assistance in locating an authorized service agent in your area. Please review your product warranty carefully. Malfunctions that are caused by neglect or misuse may not be covered under the warranty and you will be billed by the service agency for the call. +Can I purchase used equipment from you? The Innovative Foodservice Companies only sell new product. We do not sell used or refurbished equipment. We accept online payment of VISA, MASTERCARD, DISCOVER and AMERICAN EXPRESS for your convenience. We also accept business and personal checks, but this payment method must be prearranged prior to placing your order. Please contact us for help in prearranging payment by check. +I changed my mind, how do I cancel my order? Orders that have not been shipped can be cancelled immediately by contacting Customer Service at 1-800-266-9645 or via email to custserve@louiswohl.com. If your order has already shipped and you still wish to cancel your order, you will be responsible for all round trip shipping charges and restocking charges. If your order already shipped, simply refuse it when it arrives, send it back at your cost and we will credit for the order less than the applicable shipping and restock charges. +Will I be charged sales tax? All orders that are shipped to addresses within the state of Florida are subject to Florida state sales tax. Orders shipped outside of Florida may have applicable state taxes applied. IF taxes are not applied, it is the purchasers responsibility to pay their states sales tax on the products purchased. If you are tax exempt, or purchasing for resale, it is essential that you produce proper documentation when initiating the purchase. +What should I do if the order arrived and there is visible damage to the package? Be sure to note any damage or suspect areas of the shipment with the delivery person prior to signing and accepting the delivery. Contact Customer Service at 1-800-266-9645 immediately if you are unsure of whether you should accept the shipment or not. You do have the right to refuse receipt of a shipment if damage is obvious. Please note any damage on the delivery bill and with the driver prior to allowing him to leave, as this will become a key component to filing the freight claim with the carrier for reimbursement. Please remember that it is EXTREMELY important to always fully inspect your shipment before signing for it. Once you sign for a shipment, the carrier will assume that any damage discovered later did not occur during shipping and they will refuse any freight claims. Your signature on any delivery ticket is an acknowledgment that the shipment was received in good condition and without damage or shortage. If any driver demands to leave before your shipment has been inspected, note on the delivery receipt (near your signature) that the driver would not allow for inspection. +My order has concealed damage that was not noted on the delivery, what do I do now? In the majority of cases, the carrier will assume that the damage occurred after delivery and will refuse claims against. Please contact Customer Service at 1-800-226-9645 as soon as possible, as some carriers may consider a "concealed damage" freight claim, but only within 5 calendar days of the delivery date. +What happens when an item is out of stock? Every effort is made to ensure that the items on our website are in our warehouse. However, there will be times when an item is on back order due to manufacturing delays, shipping delays or the quantity ordered is greater than the amount that we generally keep in stock. Non-stock items cannot be ordered on the website. Please call customer service at 1-800-226-9645. We are unable to backorder items for you or hold partial orders until additional stock arrives. To check on an arrival date of an item, please contact customer service at 1-800-226-9645 during our normal working hours. +I am not a restaurant, can I still buy from you? Although we are primarily a source for the commercial foodservice customer, we welcome your business! 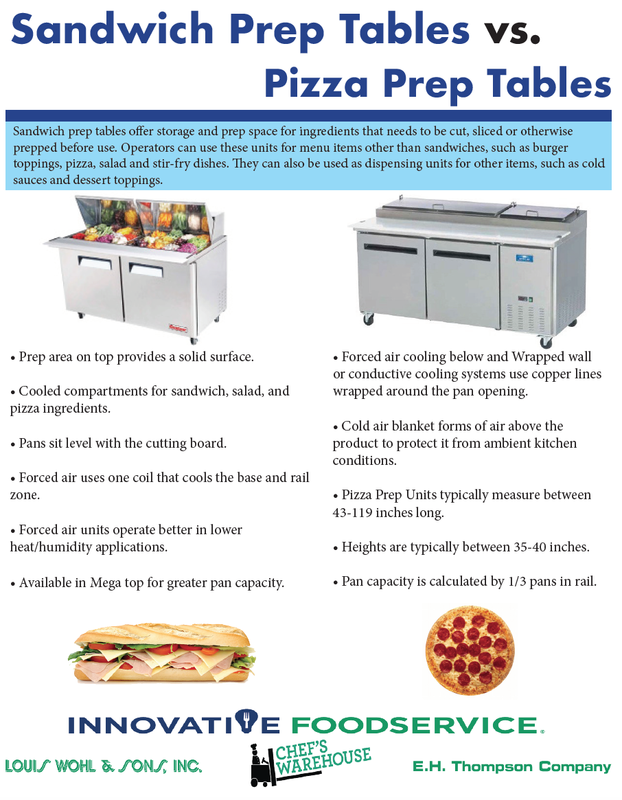 The majority of our products can be used at home, but please keep in mind that most of the products we sell are designed for power, utility, and heavy use that is found in a commercial foodservice environment. +I want to open a restaurant, can you help me? Most definitely we can. Your first step is to set up an appointment with our IF Design Team. A representative from our design department will meet with you to discuss your concept and location with you to start. We do design, and design/build which allows you to employ us as a single source. We would be responsible for the planning, design, design, specifying, purchasing and setting-in place for your new restaurant. We also offer installation. We arrange for start-up, calibration, adjustment and staff training on your equipment. To learn more about our design team visit www.ifdesignteam.com. +Can I get my purchase shipped to me? Yes, we ship to all 50 states and to the Caribbean. After placing your order, a shipping quote will be emailed to you for your approval. +How does shipping get calculated? Rates for FedEx & UPS are calculated automatically based on current rates, factoring in the dimensions, weight and how many boxes are to be shipped, and, of course, the distance. Rates for common carrier (truck freight) shipments are more difficult to calculate. In addition to the weight and dimensions of the items, the number of pallets needed, the freight classification, as well as the distance are all factors calculating the rate. Some shippers add for cost of palletizing. If your order requires a common carrier freight quote, we usually have this information by the end of the working day, which we can provide you. +What does standard shipping mean? Standard shipping covers the shipment from our loading dock to your desired shipping address, insured up to $100. FedEx & UPS shipments are delivered to either the front door or reception area, if available. Larger shipments, that are shipped by common carrier, will be delivered to your loading dock and will require a signature by the receiving personnel. If a loading dock is not available, the delivery will be made curbside, which means that the driver is only responsible for getting the shipment to the interior end of the trailer. You are responsible for unloading, unpacking and taking the merchandise indoors. Please be aware the shipping costs do not include a liftgate. If you do not have a loading dock, we highly recommend purchasing additional lift gate service, especially for heavy and/or bulky items. +Are there any extra charges when shipping? Yes, there can be! There are services that are not included in the standard shipping cost, but are available at an additional cost. When ordering large or heavy equipment and delivering to locations without a loading dock, you will need a truck with a lift gate. The lift gate is used to lower the shipment to the ground. If you require inside delivery, where the shipment is brought inside and set in place, keep in the original packing materials, if possible. +Can I have a shipment sent C.O.D? +Do you ship outside of the U.S.? Yes, we will ship all over the world. International shipping rates are determined by a variety of factors, including but not limited to: weight, dimensions, number of boxes, destination, fees and tariffs and desired transit time. Please contact Customer Service 1-800-226-9645 for assistance in determining the best shipping method to your destination. Going green saves money, is good for health of employees and patrons, increases popularity and improves local, national, and global communities. Becoming a greener foodservice establishment is rewarding. Saving money by reducing the use of engery and water is one of several rewards. On average, restaurants can reduce their energy and water bills by as much as 30 percent. Having a green attitude toward the environment not only benefits the restaurants financially by reducing overall operating cost, but also increases profits by creating healthy dining and work environments. + How can I reduce energy consumption? Restaurants are the largest consumer of electricity in the commercial sector. Foodservice facilities need to strive to be carbon-neutral and use only sustainable sources of energy. Achieve this by using more energy-efficient equipment, offsetting enegry usage, and generating on-site renewable clean sources of energy. Three areas control costs: operations, maintenance and purchasing. + How can I eliminate waste? An average restaurant can produce 150,000 lbs of garbage each year. Foodservice facilities can move toward the goal of becoming zero-waste by reducing waste output, increasing reusable items, recycling, and composting the rest. + In what areas can I eliminate Waste? An average restaurant can use 300,000 gallons of water per year. Management of water includes the areas of landscaping, food preparation, dining/serving, dishwashing, ice production, restrooms and maintenance. 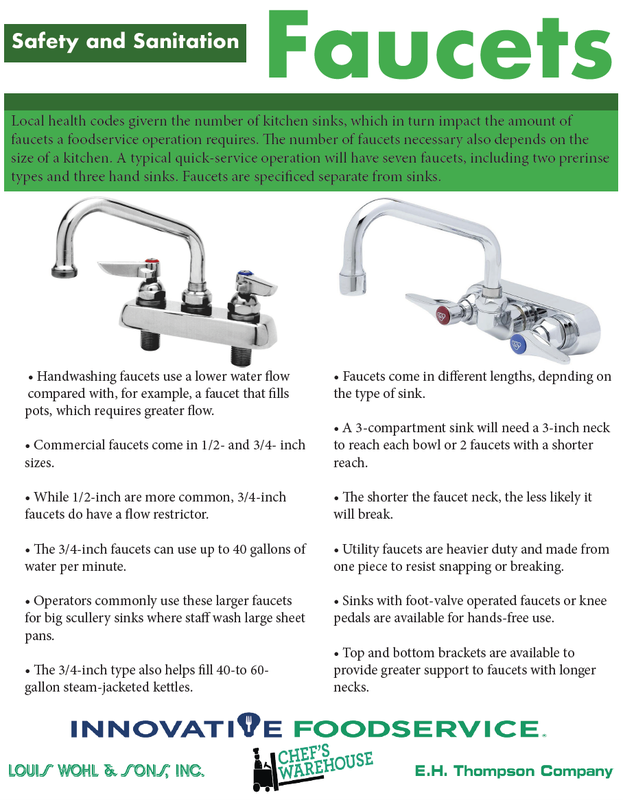 Promoting water efficiency and conservation in your foodservice facilities will result in long term gains. + Why buy sustainable materials? Foodservice facilities should make environmentally responsible purchasing decisions when considering supplies, furnishings and building materials. Aiming for sustainability is not going against a financial bottom line but purchasing with both profit and "green" as your guiding commitments. Eco responsibility is a selling point for your establishment - and your sustainable furnishings are a visual commitment you can use in your advertising. + What are recycled/bio-based disposables? Recycled/bio-based disposables are products that are made from bio-based materials that are compostable/biodegradable, or materials that have been previously recycled and made into these new products. The goal is to move your foodservice facilities toward using products that don't require extracting virgin resources, especially petroleum-based resources. + How can I reduce harmful chemicals and pollutions? Air and water pollution are major issues facing our society. Chemical reduction can be achieved by purchasing products that meet Green Seal standards such as solvents made from citrus and glass cleaners made from vinegar. Pollution can be reduced by creating a smoke-free environment and by using pesticides with natural ingredients that are eco-friendly.